During the holiday season, there is nothing we like more than gathering our friends and family close for some hot toddies, mulled wine and a delicious home cooked meal. A guaranteed crowd pleaser is “Candy Cane Chicken.” Sure, it might be “unconventional” or “bizarre” or as one critic claimed “what?!? !”, but that’s just the classic CMYK edge and pizazz. The original recipe was passed down for generations (probably at least 2,000 years) to one of our agents. Luckily, we still have the original manuscript it was written on, and are thrilled to share it with you today. Enjoy!! I have been incredibly fond of this recipe since I was a young child – My grandmother lived on a farm in rural Kentucky and every year, around the holidays, we would travel over the river to help decorate the tree. 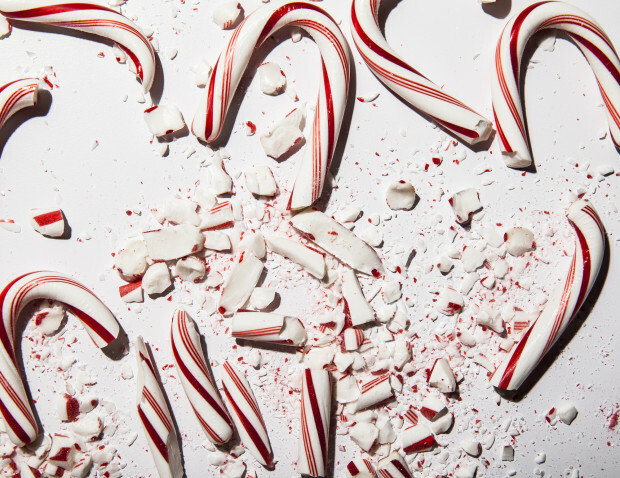 We always had extra candy canes, so she made up this recipe from scratch. I have updated it a little bit with some more modern ingredients, but it is always delicious and a fun treat to have at a holiday get-together. 4. Heat a skillet with a small amount of oil in the pan – just enough to pan fry the edges of the chicken. Preheat oven to 400. 5. Put chicken in the egg wash and then flour the chicken with the candy cane/nut mixture. 7. Remove chicken from pan and place in small glass cookware. 8. Take a couple of slices of butter and place them around and on the chicken. 9. Place Foil over the chicken and bake in oven for 15-20 min. – I usually serve these with a roasted red potato mash with fresh rosemary – I could always use a little more red and green around the holiday!